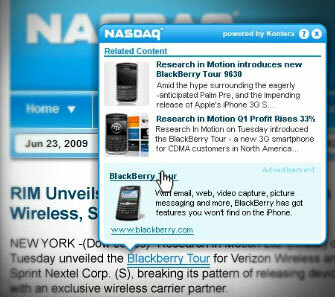 Kontera delivers the most relevant In-Text Advertising & Related Information solutions online. Kontera’s patented technology performs real-time semantic analysis of content and other information to dynamically hyper-link the terms that most accurately represent and predict user-intent and engagement. Kontera enhances consumer experience through superior phrase relevance, driving increased user interaction, unparalleled campaign performance for advertisers, and substantial revenue for publishers. Reaching more than 100 Million unique users per month, Kontera’s exclusive network features over 15,000 premium and niche publishers and represents a unique opportunity for advertisers to reach their target audiences through innovative text, rich media and video advertising units. Using its patented semantic engine to analyze and understand the true meaning of a page, Kontera delivers relevant ads and information to your users while driving significant, complimentary revenue to your bottom line. Since Kontera’s In-Text Advertising units are only activated when users engage with them, Kontera is a non-intrusive way to enhance the user’s browsing experience on your website or blog and deliver additional revenue along with control over the look and feel of your site. Add Kontera ads on your website today using our simple sign-up process.